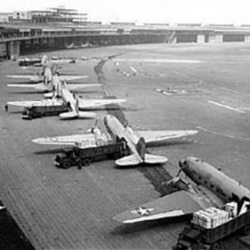 On June twenty-sixth, the first C-47s landed at Tempelhof Airport – the beginning of the great operation that was to come. Plans called for the operation to last just a few weeks. The planes landed in the blockaded city and local volunteers provided support on the ground. Former mechanics of the Luftwaffe, the German air force, joined Americans in servicing the aircraft. More than twenty thousand Berliners worked day and night to build an additional landing field for the American and British planes. It became Tegel, now Berlin’s major airport. As part of the supply effort, the British Royal Air Force even landed Sunderland Flying Boats on a Berlin lake. Brigadier General Joseph Smith was appointed task force commander of the American part of the airlift. General Smith called the mission “Operation Vittles,” using an American slang term for food. “Operation Vittles” also led to “Operation Little Vittles” for the dropping of chocolates and other treats to children. The pilots who did this became known as “Candy Bombers.” Appreciative German children called them “Die Schokoladen Flieger” – the chocolate pilots. It was the idea of Gail Halvorsen, a pilot in the United States Air Force. 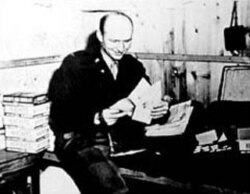 Lieutenant Halvorsen became known as “Mister Wiggly Wings.” From his plane, he would drop chewing gum and chocolates attached to tiny parachutes made from handkerchiefs. You can find our series online with transcripts, MP3s, podcasts and pictures at voaspecialenglish.com. And you can follow us on Facebook and Twitter at VOA Learning English. I’m Steve Ember, inviting you to join us again next week for THE MAKING OF A NATION -- American history in VOA Special English.